Dr. Joshua Chou is a lecturer in the School of Life Sciences and the Course Director for the MSc in Biomedical Engineering. Dr. Chou also serve as a core member of the Centre of Health Technology and is a member of the UTS Postdoctoral Association. Dr. Chou’s laboratory works at the interface of biomaterials, cell mechanics, physics and cell biology, seeking to understand how physical properties and biological function affect each other in different cellular systems and diseases. These basic mechanical processes have profound effect in health (organ growth, heart/lung development) and diseases including cancer and osteoporosis. Working with an international multidisciplinary team of engineers, biologists, and physicists from Harvard and MIT, the team seeks to understand physical properties of the living cell and their impact in health and disease. 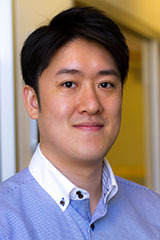 By combining and applying the latest technology in mechanobiology, CRISPR/cas9 gene editing with single-cell sequencing, AI machine learning with super-resolution imaging, microfluidics and micro-contact patterning, Dr. Chou seek to understand disease mechanotransduction in hope of identifying therapeutic targets. Dean’s Scholar, Harvard School of Dental Medicine: Mechanobiology, microfluidics and CRISPR/cas9 gene editing. Japan Society for the Promotion of Science Postdoctoral Fellow: Development of pharmaceutical drug delivery systems and in-vivo rodent experiments and imaging. Dr. Chou is an Editor for the Journal of Australia Ceramic Society and the Journal of Advances in Ceramic Science and Engineering. He also serves as a member of the editorial board for Journal of Tissue Engineering and Regenerative Medicine and International Journal of Biomaterials. Dr. Chou’s research has had publicity in the national media: radio (ABC, 2ser), newspaper (Sydney Morning Herald (2010) and magazines (Materials Australia, U:Magazine, Researcher in Focus). Dr. Chou has experience in mentoring Honors, PhD and Postdoctoral Fellows. He was the course director for the Advanced Graduate Education research program at Harvard. Dr. Chou is highly interested in teaching students and mentoring early career researchers. Please contact Dr. Chou directly to discuss potential projects. Project offerings are available in the following areas but not limited to. © 2018 Taylor & Francis A novel biomimetic vascular graft scaffolds were produced by electrospinning method with the most superior characteristics to be a proper biomimetic small diameter blood vessel using Polycaprolactone(PCL), Ethyl Cellulose(EC) and Collagen Type-1 were used to create the most convenient synergy of a natural and synthetic polymer to achieve similarity to native small diameter blood vessels. Scanning Electron Microscopy(SEM), Fourier Transform Infrared Spectroscopy(FTIR), Differential Scanning Calorimetry Analysis(DSC), tensile measurement tests, and in-vitro and in-vivo applications were performed. Results indicated significant properties such as having 39.33nm minimum, 104.98nm average fiber diameter, 3.2MPa young modulus and 135% relative cell viability. Modified titanium (Ti) substrates with titanium dioxide (TiO2) nanotubes have broad usage as implant surface treatments and as drug delivery systems.To improve drug-loading capacity and accelerate bone integration with titanium, in this study, we hydrogenated anodized titanium dioxide nanotubes (TNTs) by a thermal treatment. Three groups were examined, namely: hydrogenated TNTs (H2-TNTs, test), unmodified TNTs (air-TNTs, control), and Ti substrates (Ti, control).Our results showed that oxygen vacancies were present in all the nanotubes. The quantity of -OH groups greatly increased after hydrogenation. Furthermore, the protein adsorption and loading capacity of the H2-TNTs were considerably enhanced as compared with the properties of the air-TNTs (P<0.05). Additionally, time-of-flight secondary ion mass spectrometry (TOF-SIMS) was used to investigate the interactions of TNTs with proteins. During the protein-loading process, the H2-TNTs not only enabled rapid protein adsorption, but also decreased the rate of protein elution compared with that of the air-TNTs. We found that the H2-TNTs exhibited better biocompatibility than the air-TNT and Ti groups. Both cell adhesion activity and alkaline phosphatase activity were significantly improved toward MG-63 human osteoblast-like cells as compared with the control groups (P<0.05).We conclude that hydrogenated TNTs could greatly improve the loading capacity of bioactive molecules and MG-63 cell proliferation. Although growth factors and drugs (BMP-2, dexamethasone, etc.) have been widely used for bone tissue engineering, they have unignored limits such as adverse effects at high concentrations and easy inactivation in vivo. Accordingly, more osteoinductive supplements without side effects should be considered as alternatives in the design of bone tissue engineering scaffolds. Nanosilicate is a bioactive inorganic nanomaterial consisting of hydrous sodium lithium magnesium silicate, which is recently found to be safe and effective for bone induction. In this study, a range of organic/inorganic nanofibrous scaffolds with varied nanosilicate concentrations (0%, 1%, 5%, and 10% w/w to PCL matrix) were successfully fabricated via electrospinning. The tensile properties of the nanofibers were enhanced at low nanosilicate concentrations, and the incorporation of nanosilicates had no influence on cytocompatibility. Besides, in vitro osteogenesis experiments showed that nanosilicates-doped nanofibers were capable of inducing bone formation better than pure PCL nanofiber samples. More importantly, the results of histological and immunohistochemical assessments further revealed that the nanosilicates-enriched nanofibers had a significant potential of ectopic bone formation in vivo, while the pure PCL samples only induced limited osteogenic cues. All these results indicate that the nanosilicates-based organic/inorganic nanofibers may be potentially efficient for bone tissue engineering. Irisin is secreted by muscle, increases with exercise, and mediates certain favorable effects of physical activity. In particular, irisin has been shown to have beneficial effects in adipose tissues, brain, and bone. However, the skeletal response to exercise is less clear, and the receptor for irisin has not been identified. Here we show that irisin binds to proteins of the V class of integrins, and biophysical studies identify interacting surfaces between irisin and V/5 integrin. Chemical inhibition of the V integrins blocks signaling and function by irisin in osteocytes and fat cells. Irisin increases both osteocytic survival and production of sclerostin, a local modulator of bone remodeling. Genetic ablation of FNDC5 (or irisin) completely blocks osteocytic osteolysis induced by ovariectomy, preventing bone loss and supporting an important role of irisin in skeletal remodeling. Identification of the irisin receptor should greatly facilitate our understanding of irisin's function in exercise and human health. An efficient surface modification for upconversion nanoparticles (UCNPs) is reported via supramolecular host-guest self-assembly. Cucurbituril (CB) can provide a hydrophilic surface and cavities for most biomolecules. High biological efficiency, activity and versatility of the approach enable UCNPs to be significantly applied in bio-imaging, early disease detection, and bio-sensing. The aim of this study was to investigate tissue destruction and inflammatory progression of ligature-induced peri-implantitis in mice and to establish an alternative murine model of peri-implantitis.Sixty male C57BL/6NCrSlc mice (4-week-old) were used and the maxillary right first molars were extracted. Eight weeks after extraction, custom-made pure titanium machined screw type implants (0.8 × 1.5 mm) were placed, one implant per animal. Four weeks later, 5-0 silk ligatures were applied around implant necks to induce peri-implantitis. Animals were sacrificed at 0 (before ligature), 7, 14, 21 and 28 days after ligature. Half of the samples were analyzed radiologically and histologically to measure bone level change, osteoclast number, density, and distribution. The rest of the samples was used to determine the relative mRNA expression levels of IL-1 and TNF- with RT-PCR analysis.Bone levels at all sites (buccal, palatal, mesial, distal) decreased 40-50% significantly 28 days after ligature (P < 0.01). Osteoclast number at all post-ligature time points increased significantly (P < 0.05). However, their density at day 28 decreased significantly compared to that of day 21 (P < 0.05). Accordingly, IL-1 and TNF- mRNA expression increased significantly at the early time points but decreased significantly at day 28 after ligature (P < 0.05).Inflammatory response followed by significant peri-implant bone resorption suggested 28 days ligation is sufficient to successfully induce peri-implantitis in the current mice model. This model might open a new avenue to study the pathogenesis and mechanism of peri-implantitis. © 2016 Trans Tech Publications, Switzerland. Bioceramics is very important application for dental and orthopedic procedures. Beside all these normal procedures traffic accidents are requiring increasing number of graft, prostheses and orthosis applications. Bioceramics can be produced from local and natural sources with various methods. Those can be produced from various bone structures through calcination (at high temperatures) or with diluted hydrochloric acid (HCl) application & freeze drying. Beside these methods calcite and aragonite structures like from sea shells and egg shells bioceramic production can be realized through mechanochemical processing via a simple hot-plate or ultrasonic equipment. A fresh water snail shell (Zebra Nerite Snail-Neritina natalensis) was prepared as bioceramic production source. The resulting hydroxyapatite (HA) powders were obtained without any impurities. At two varying temperature of 865 and 885 0C the snail shells was transformed to HA bioceramics. Scanning electron microscopy (SEM), X-ray diffraction (XRD) and differential thermal analysis (TG/DTA) were evaluated. © 2016 Trans Tech Publications, Switzerland. Calcium phosphates are very important biomaterials for orthopaedic and dental applications. Hydroxyapatite (HA) is one of the important phases used for grafting. Those are produced from synthetic and natural sources with various methods. Especially nano-bioceramics can be produced through calcitic and aragonitic structures (i.e. mussel shells, sea snail shells, land snail shells and sea urchin shells). The plate limpet shells were used. The plate limpet is a gastropod, a soft-bodied invertebrate (an animal without a backbone) that is protected by a very hard, flattened conical shell. In this study the Plate Limpet (Tectura scutum) shells were obtained from a local gift store in Istanbul. The habitation of these limpets broadens from south Alaska down to California-Mexico. First the exact 97 % CaCO3 content was measured with thermal analysis (DTA/TGA). Here in this study agitation was preformed on a hot-plate. First the temperature was fixed at 80 °C for 15 min. Then equivalent amount to 1.92 mmol CaO H3PO4was added dropwise for affecting HA phase formation and the reaction was set on a hotplate for 8 hours. The dried sediments HA part was divided into 2 groups. One group was sintered to 835 °C and second group to 855 °C. Here x-ray diffraction and scanning electron microscope (SEM) analyses were performed. From the study various HA phases and TCP phases were obtained. A previous study done with Atlantic Deer Cowrie encourages nanobioceramic production from natural sources. This study proposes that mechanochemical agitation with very simple way for producing nano-sized calcium phosphates for future bioengineering scaffold applications. BACKGROUND: The purpose of this study was to evaluate the vertical new bone formation induced by sputtered HA-coated titanium implants (HA-coated) compared with sandblasted acid-etched titanium implants (noncoated) in a rabbit calvarial model. MATERIALS AND METHOD: Twenty HA-coated and 20 noncoated titanium implants were divided equally into four groups as HA-coated implant (HA); noncoated implant (NC); HA-coated implant with membrane (HA/M); noncoated implant with membrane (NC/M). All implants were placed 5 mm above the original bone (OB). Collagen membranes were placed over the implants in HA/M and NC/M groups. The animals were sacrificed at 4 weeks (n=5) and 8 weeks (n=5). Vertical bone height above OB (VBH, mm) and augmented bone area (ABA, mm(2) ) were analyzed histologically and radiographically. RESULTS: At 4 weeks, VBH reached significantly higher level in HA/M group compared with other three groups (p<0.05). At 8 weeks, significant difference was detected between HA/M and NC groups (p<0.05). At 4 and 8 weeks, ABA in HA/M group was significantly larger compared with other three groups (p<0.05). CONCLUSION: The present results indicated that sputtered HA-coated titanium implant together with collagen membrane could be a novel and effective approach for vertical bone augmentation. © 2014 Wiley Periodicals, Inc. J Biomed Mater Res Part B: Appl Biomater, 2014. Several studies have shown the effectiveness of zinc-tricalcium phosphate (Zn–TCP) for bone tissue engineering. In this study, marine calcareous foraminifera possessing uniform pore size distribution were hydrothermally converted to Zn–TCP. The ability of a scaffold to combine effectively with mesenchymal stem cells (MSCs) is a key tissue-engineering aim. In order to demonstrate the osteogenic ability of MSCs with Zn–TCP, the scaffolds were cultured in an osteogenic induction medium to elicit an osteoblastic response. The physicochemical properties of Zn–TCP were characterized by XRD, FT–IR and ICP–MS. MSCs were aspirated from rat femurs and cultured for 3 days before indirectly placing four samples into each respective well. After culture for 7, 10 and 14 days, osteoblastic differentiation was evaluated using alizarin red S stain, measurement of alkaline phosphatase (ALP) levels, cell numbers and cell viability. XRD and FT–IR patterns both showed the replacement of CO32– with PO43–. Chemical analysis showed zinc incorporation of 5 mol%. Significant increases in cell numbers were observed at 10 and 14 days in the Zn–TCP group, while maintaining high levels of cell viability (> 90%). ALP activity in the Zn–TCP group was statistically higher at 10 days. Alizarin red S staining also showed significantly higher levels of calcium mineralization in Zn–TCP compared with the control groups. This study showed that MSCs in the presence of biomimetically derived Zn–TCP can accelerate their differentiation to osteoblasts and could potentially be useful as a scaffold for bone tissue engineering. The aim of this study was to examine the bone regeneration properties of beta-tricalcium phosphate hydrothermally converted from foraminifera carbonate exoskeleton in the repair of rat calvarial defect. These natural materials possess unique interconnected porous network with uniform pore size distribution, which can be potentially advantageous. In total, 20 adult male Wistar rats received full-thickness calvarial defect with a diameter of 5 mm. The rate of newly formed bone was measured radiologically by X-ray and micro-computed tomography and by histologic examination. After 2 weeks, the beta-tricalcium phosphate group exhibited full closure of the defect site, while control group remained unrestored at the end of the 6-week experimentation. It was observed that the newly regenerated bone thickened over the course of the experiment in the beta-tricalcium phosphate group. No soft tissue reaction was observed around the beta-tricalcium phosphate implant and the rats remained healthy. These results showed that repair of the calvarial defect can be achieved by biomimetic beta-tricalcium phosphate macrospheres, which hold potential for application as bone grafts for bone augmentation surgeries. Marine species, such as corals, sea shells and nacres, attract special interest in bioceramics field for bone graft, bone cements and drug delivery applications. Most of the marine structures are made up of pure calcium carbonate (calcite or aragonite) with a very small amount of an organic matrix. In the past the most common way to transform these structures to hydroxyapatite was hydrothermal transformation method. This current work introduces a new approach for producing fine powders of calcium phosphates from Mediterranean mussel (Mytilus galloprovincialis) shells. A comparative study was carried out to investigate the differences of these powders under only hot plate heating and hot plate heating together with ultrasonic agitation while H3PO4 was added. The temperature of the hotplate was kept constant at 80 °C and then, H3PO4 was added drop wise into the solution for 2 hrs. The mixture was then placed into an oven at 100 °C for 24 hrs. They were further calcined at 800 °C for 3 hrs. XRD, FTIR and ICP-MS were used to identify the structure and composition. It was found that the final powders were predominantly monetite, with some tricalcium phosphate as a secondary phase. This relatively simple and efficient method can be easily applied to produce calcium phosphate precursor powders for a range of biomedical applications. Biomimetic materials such as coral exoskeletons possess unique architectural structures with a uniform and interconnected porous network that can be beneficial as a scaffold material. In addition, these marine structures can be hydrothermally converted to calcium phosphates, while retaining the original structural properties. The ability of biomaterials to stimulate the local microenvironment is one of the main focuses in tissue engineering, and directly coating the scaffold with stem cells facilitates future potential applications in therapeutics and regenerative medicine. In this article we describe a new and simple method that uses a laboratory centrifuge to coat hydrothermally derived beta-tricalcium phosphate macrospheres from coral exoskeleton with stem cells. In this research the optimal seeding duration and speed were determined to be 1?min and 700 g. Scanning electron micrographs showed complete surface coverage by stem cells within 7 days of seeding. This study constitutes an important step toward achieving functional tissue-engineered implants by increasing our understanding of the influence of dynamic parameters on the efficiency and distribution of stem cell attachment to biomimetic materials and how stem cells interact with biomimetic materials. Bone formation and regeneration is a prolonged process that requires a slow drug release system to assist in the long-term recovery. A drug-delivery system is developed that allows for the controlled release of simvastin, without exhibiting the side effects associated with high concentrations of simvastatin, and is still capable of inducing constant bone formation. The aim of this study was to evaluate the therapeutic efficacy of biomimetic zinc-containing tricalcium phosphate (ZnTCP) produced by hydrothermally converting calcium carbonate exoskeletons from foraminifera, in the treatment of osteoporotic mice. X-Ray powder diffraction showed crystallographic structures matching JCPDS profile for tricalcium phosphate. Mass spectroscopy used to calculate total composition amount showed similar amount of calcium (5×104 µg/g) and phosphate (4×104 ppm) after conversion and the presence of zinc (5.18×103 µg/g). In vitro zinc release showed no release in PBS buffer and <1% zinc release in 7 days. In vivo evaluation was done in ovariectomized mice by implanting the ZnTCP samples in the soft tissues near the right femur bone for four weeks. Thirty ddY mice (5 weeks old, average weight of 21 g) were divided into six experimental groups (normal, sham, OVX, ß-TCP, ZnTCP and direct injection of zinc). CT images were taken every two weeks where the bone mineral density (BMD) and bone mineral content (BMC) were calculated by software based on CT images. The ZnTCP group exhibits cortical and cancellous bone growth of 45% and 20% respectively. While sham, OVX and ß-TCP suffered from bone loss. A correlation was made between the significant body weight increase in ZnTCP with the significant increase in plasma zinc level compared with OVX. The presented results indicate that biomimetic ZnTCP were effective in preventing and treating bone loss in osteoporotic mice model. A vital ingredient for engineering bone tissue, in the culture dish, is the use of recombinant matrix and growth proteins to help accelerate the growth of cultivated tissues into clinically acceptable quantities. The skeletal organic matrices of calcifying marine invertebrates are an untouched potential source of such growth inducing proteins. They have the advantage of being ready-made and retain the native state of the original protein. Striking evidence shows that skeleton building bone morphogenic protein-2/4 (BMP) and transforming growth factor beta (TGF-ß) exist within various marine invertebrates such as, corals. Best practice mariculture and the latest innovations in long-term marine invertebrate cell cultivation can be implemented to ensure that these proteins are produced sustainably and supplied continuously. This also guarantees that coral reef habitats are not damaged during the collection of specimens. Potential proteins for bone repair, either extracted from the skeleton or derived from cultivated tissues, can be identified, evaluated and retrieved using chromatography, cell assays and proteomic methods. Due to the current evidence for bone matrix protein analogues in marine invertebrates, together with the methods established for their production and retrieval there is a genuine prospect that they can be used to regenerate living bone for potential clinical use. Bisphosphonate is known to be a very active drug in the treatment of osteoporosis and bone regeneration. A new method has been developed, utilizing nuclear magnetic resonance spectroscopy to identify and measure the amount of bisphosphonate in solution. A standard reference with similar functional group to that of the bisphosphonate was chosen and applied in the experimentation. The results showed that the use of nuclear magnetic resonance spectroscopy (H-1-NMR) in determining the solvent residues of various pharmaceutical drugs has proved to be effective. Unlike chromatography, it is possible to use a universal reference standard as an internal standard assayed by quantitative NMR. Using the same theory, this method is capable of both identifying and quantifying the bisphosphonate in various solutions. This paper is the first publication showing this unique measurement method, which can be used in a range of pharmaceutical and biomedical applications. Coral sand grains were analysed using simultaneous differential thermogravimetric analysis (DTA/TGA) Fourier-Transform infrared spectroscopy (FTIR), x-ray diffraction (XRD) and environmental scanning electron microscopy (ESEM). These techniques were performed to confirm the characteristics and properties as well as the composition of the coral sand grains. Imaging of the full surface topography were conducted inthe ESEM. After characterisation coral sand grains were treated for impurities and organic materials were subsequently removed. The materials were then converted to calcium phosphates utilising hydrothermal treatment. The results have shown that the coral sand grains were composed of calcium carbonate with a network of uniform inner porous structure. The ESEM has provided valuable information through the imaging of the samples which in turn allowed a comparison of the pore sizes before and after the hydrothermal treatment. The current study shows that the coral sand to be a promising source of converted calcium carbonate to calium phosphates for biomedical applications. Lewis, KC, Choi, AH, Chou, J & Ben-Nissan, B 2007, 'Nanoceramics in medical applications', Materials Australia, vol. 40, no. 3, pp. 32-34. © Springer International Publishing Switzerland 2016.There is currently an urgent need to develop sustainable and therapeutically relevant advanced drug delivery systems to treat the prevalence of ongoing human diseases and ailments. The effectiveness of such system will depend primarily on the properties and characteristics of the carrier material. In this chapter, marine materials are investigated as potential drug delivery carriers for bone tissue engineering and in the treatment of osteoporosis. This chapter will explore the unique structures of marine materials that set it apart from its synthetic counterparts and the conversion to biocompatible calcium phosphates combined with synthetic modifications, and case studies will demonstrate the potential clinical applications. Nanostructured materials are associated with a diversity of uses within the medical field, for instance, in drug-delivery systems, regenerative medicine, formation of surgical tools, medical devices, and diagnostic systems. It has long been established that porous bulk hydroxyapatite (HAp) cannot be used for load-bearing applications due to its unfavorable mechanical properties. As a result, HAp has been used instead as a coating in orthopedic surgery on metallic alloys, metals giving the support required. Of the metallic alloys used, titanium-based and cobalt chromium alloys are the preferred materials for these HAp coatings for orthopedic and maxillofacial implants (Figure 2.1). Molecular imaging advancing stem cell-based gene therapy for osteoporosis and bone fracture regeneration.